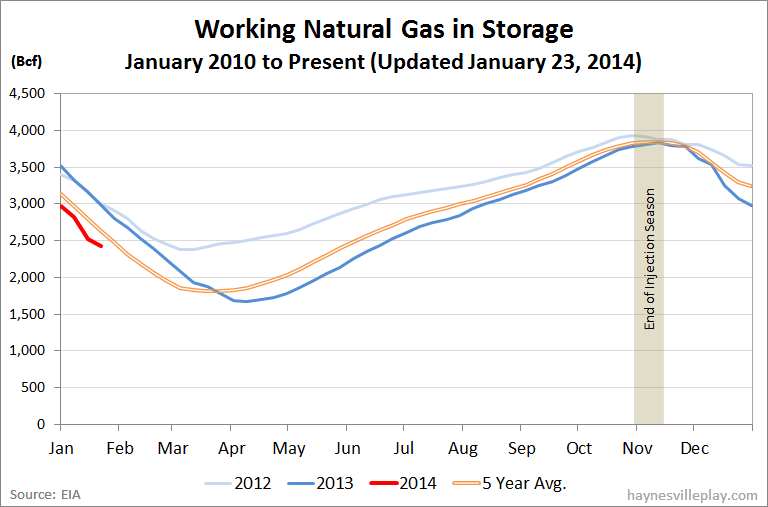 The EIA reported that working gas in storage last week was down 107 Bcf to 2.423 Tcf. The withdrawal was 61% lower than last year (-168 Bcf) and 74% below the five year average (-181 Bcf). I guess everyone was giving their heater a rest after the polar vortex of a couple of weeks ago. The current storage level is 19.8% below last year (3.021 Tcf) and 13.2% below the five year average (2.792 Tcf). Temperatures in the Lower 48 last week averaged 41.1 degrees, which was 2.6 degrees warmer than last year and 8.3 degrees warmer than average.